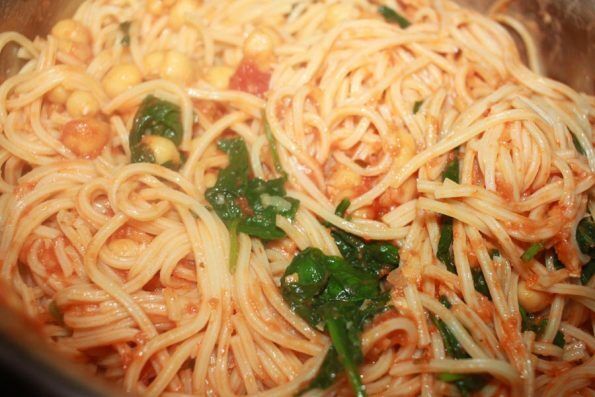 Pasta with chickpeas and spinach is so delicious and filling and if you are trying to find vegetarian/vegan protein rich (meat free) options to cook your pasta, adding chickpeas is a great way to do that. 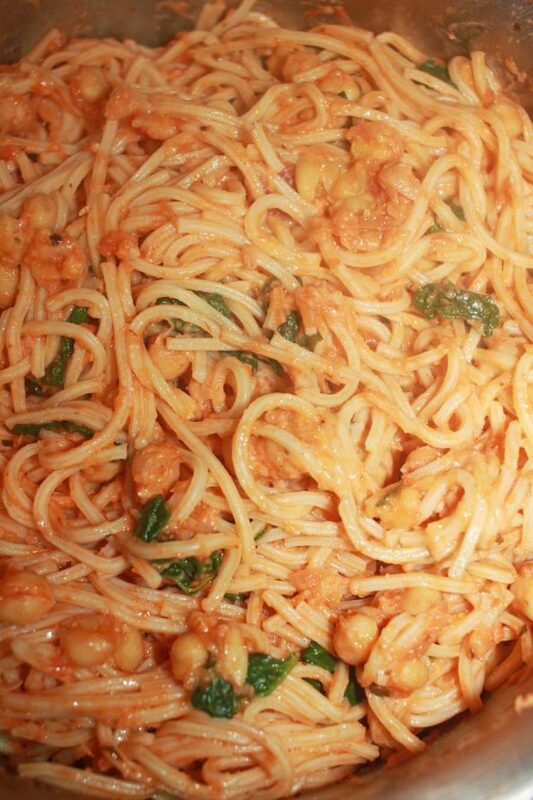 Adding chickpeas to pasta make it more delicious and filling, and this is so easy to make too. 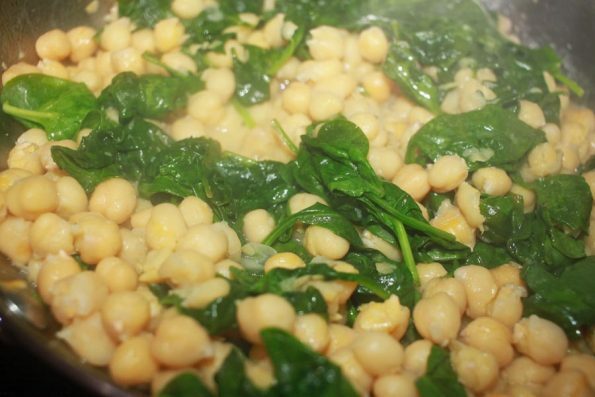 Chickpeas and spinach is a perfect combination which works very well when used in recipes and you can easily pair them both so you have a green leafy vegetable in your pasta as well as a protein rich beans (chickpeas is also known as garbanzo beans). 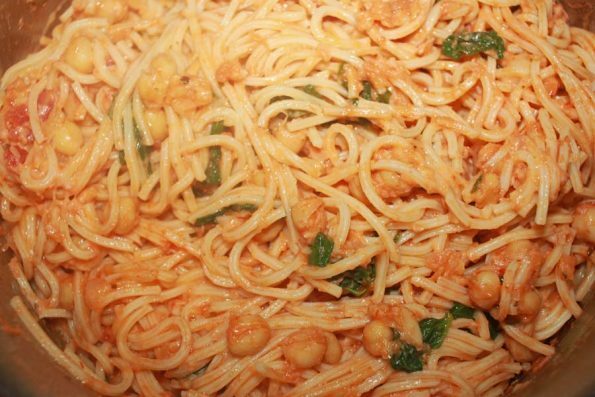 I used spaghetti rigati (a kind of spaghetti noodles) to make this delicious pasta with chickpeas and spinach but you can use almost any pasta shells that you like with this delicious combination. 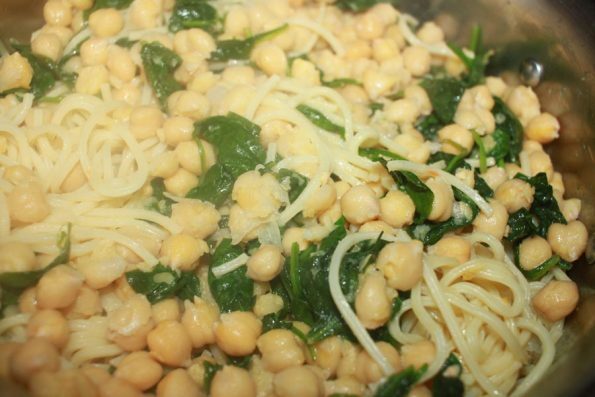 In the below picture you see the pasta with chickpeas and spinach leaves before I added the sauce and cheese, which is also very delicious as it is! After mixing in the pasta sauce (I used marinara sauce and shredded cheese) the pasta with chickpeas and spinach is more colorful too! 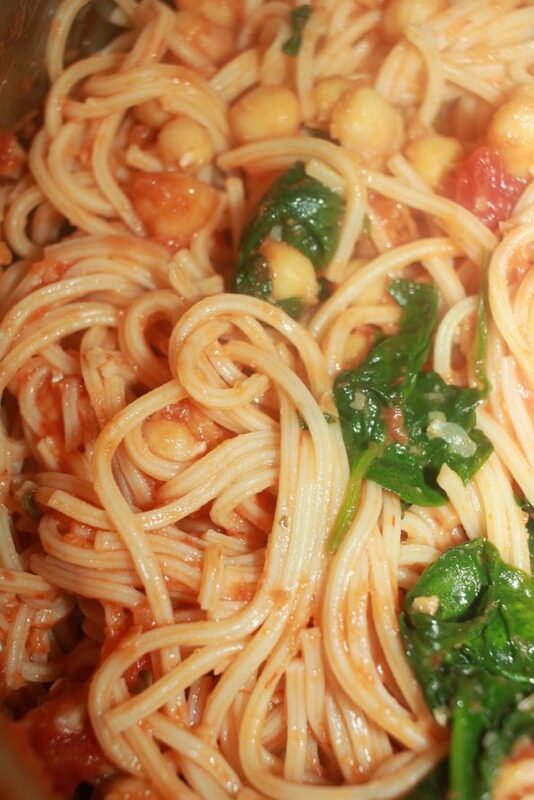 We are using cooked chickpeas to make this pasta with chickpeas and spinach. You can use canned chickpeas or use dry chickpeas to prepare this dish, but you should cook the chickpeas first to make this dish. If you are using dry chickpeas, you can soak the dry chickpeas for at least 6 to 8 hours or you can soak the chickpeas overnight for best results and cook the chickpeas in a pressure cooker or using instant pot. You can see here my post on how to cook the chickpeas using pressure cooker if you are using dry chickpeas. Also see my post on soaking chickpeas for recipes if you are not used to soaking dry chickpeas prior to cooking. 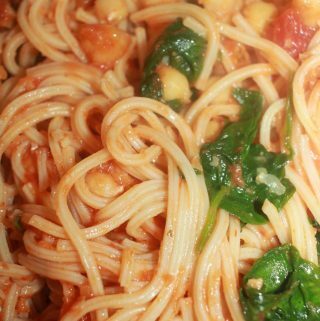 So once you have the cooked chickpeas it is so easy to prepare this delicious pasta with chickpeas and spinach leaves. I also used fresh marinara sauce and also some cheese to add more flavor to the pasta. You can adjust the amount of sauce and cheese according to your preferences. The warm pasta with added chickpeas, spinach leaves, sauce and cheese is perfect for a filling vegetarian lunch or dinner. As I mentioned above, I used marinara sauce and shredded cheese which was a combination of Mexican blend and cheddar cheese, but you can use your favorite pasta sauce and cheese as you wish, though I recommend using cheddar for pasta recipes. 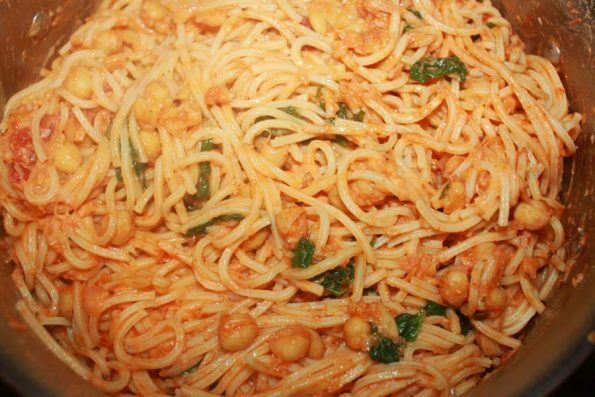 So here is how you can make easy and delicious pasta with chickpeas and spinach following this easy spaghetti recipe with chickpeas and spinach leaves. 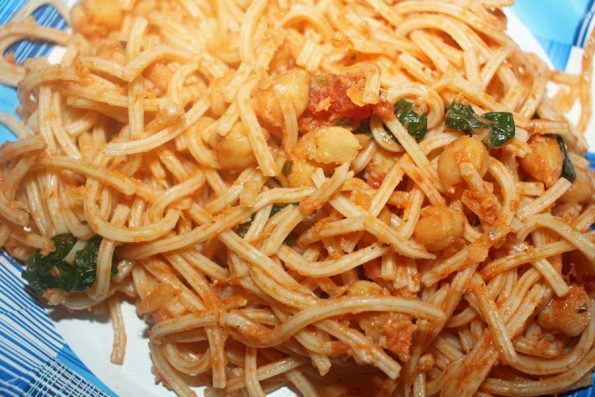 Pasta (I made this using spaghetti rigati noodles, you can use your favorite pasta shells) with added spinach leaves, cooked chickpeas, marinara sauce and cheese makes an easy and delicious vegetarian lunch or dinner. Heat enough water in a large pot or saucepan and when the water is boiling, add the pasta (I used spaghetti rigati here). Add salt, cook in medium heat for 6 to 8 minutes or follow the instructions in the pasta package until the pasta is cooked and soft enough (do not make it too soft or overcooked). Once the pasta is cooked, drain the water and save the pasta. Add a tablespoon of olive oil and gently mix in, so the pasta noodles won't stick to each other. In a separate pan, add 2 tablespoons of olive oil and add the cooked chickpeas. Add enough salt, garlic powder, stir well and saute for a minute. 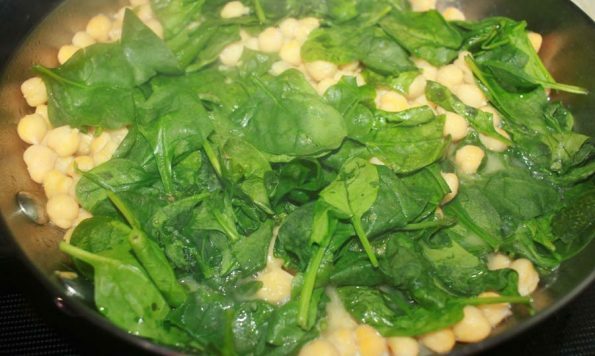 Add washed spinach leaves also to the chickpeas, and let it cook for another 2 to 3 minutes until the spinach begins to wilt. Also add the oregano powder and mix well, if you are using it. You may also add any other favorite spices that you wish to add to the pasta. Stir the chickpeas and wilted spinach to mix well and add this mixture to the cooked spaghetti noodles (or any pasta you are using). Gently mix everything until the mixture is evenly mixed with the pasta. Add the marinara sauce and remaining one tablespoon of olive, gently mix in with the pasta to evenly coat. Finally add the shredded cheese, gently mix in and serve hot for lunch or dinner! 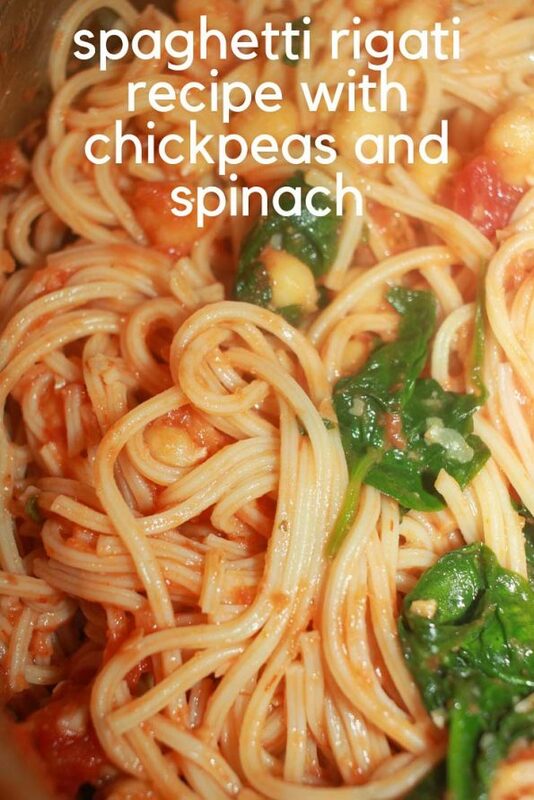 Hope you found this post on pasta with chickpeas and spinach helpful in making easy and delicious pasta for lunch or dinner.